Welcome to Bolo's Friday Weather Report and Other Adventures. The weather outside today is raining. So you get a picture of ME instead! I'm giving whoever is in charge of the rain THE LOOK. Oh, and today is my 100th Post! I know we've posted this picture before, but honestly, I am NOT AMUSED with this weather! I don't like to get wet. Mommy had been keeping me occupied though. I sat and watched the entire Season 2 of Heroes with her over the last three days. I enjoyed the series. I see myself a little bit like Peter, who does a bit of everything. I do a bit of everything. I'm a cuddler, I'm a protector, I'm a cuddler, I'm a drooler, I can shed when I want to, I'm a cuddler. I think all these things add up to great hero material. Opinions? This is my 99th post! WOW! Who knew I'd have so much to say! I need something really great for my 100th post. Mommy? Daddy? Help me think about something really NIFTY and ADVENTUROUS for my 100th post please! If my loyal readers have any ideas, those are welcome too. So there I was this morning, doing my sunbeam meditations when Mommy comes down the stairs with her camera and totally disturbs me. Sigh. So I got up, she gave me my antibiotic and then told me to lay back down so she could get a pictures. So I put on my excited face. Sarcasm Alert. Then she followed me around for a bit with her camera and took pictures while I had breakfast. Is that rude? I posed once for her. I think that was enough. I'm not on the clock here for my pei-fessional photographers model you know. These were just lucky shots. She'll owe me a walk for this. I'm going back to find my sunbeam. Maybe it hasn't moved yet. I wanted to write this last night but I was just exhausti-pei-ted. I had to go pick up Mommy from work last night! It was an ADVENTURE! Are you comfy? It's a good story. Off we went, to pick up Mommy. Daddy waved at her when we got there and she came out to see how I was doing, I kissed her nose, lucky her, and Daddy said we'd wait for her in the car after our Adventure. Here's where the fun began. Not that kissing Mommy's nose isn't fun, but you understand. First we crossed the bridge west of Mommy's workplace and we saw a train going by under us. Daddy was a bit more excited than I was about this. If it had been at eye level with me, maybe I would have been more interested, but my nose was sniffing other things. We walked down to a little antique shop to look through the window, again, Daddy was a bit more impressed about this than I was. We turned around and started walking back. We went past two young people who were loading up a van and I barked at them. They were a little confused about me. As we were crossing over the bridge, my nose went into OOO! mode. I smelled something so interesting and I had to bark to let Daddy know there was something down there that I wanted him to identify. Daddy said they were city raccoons. Daddy said they were probably getting close to 50lbs each. I just kept barking and one of them climbed up a telephone pole in the middle of nowhere. The second one looked at us for a bit and then decided his buddy had the right idea and he ran up the telephone pole too. Both of them were peeking around the telephone pole, black masks showing, trying not to look guilty and failing. I left there with a smile on my face. I'm a good boy aren't I? Booker, I got inspired to do this just from reading your blog! It's a good thing we're friends. What do you think of my technique? Anyway, we got back to the car and waited for Mommy. She came out, we came home telling her all about our adventures as Daddy drove, and I got cuddles before we all went to sleep. Not sure what I'm going to do today to top that excitement, but I'll figure something out. I know, it's officially afternoon and that says Monday Morning Report. Sorry, I've been busy reading other dogs blogs, working at making new friends, you know, that stuff. Well, the Pawlimpics are over and I think all my friends that entered won a medal. Charlie Daniels, I'm so glad you finally won one. I was getting worried about the judges. Your entries were Pawesome! I'm a little upset that the drooling event didn't go on. I was sure one had been mentioned. Here was my entry. Wouldn't it be funny if I was the only one entered! In other news and adventures, I got to go with my pawrents to an outdoor market yesterday. It smelled so good. I saw a Spaniel, a Papillion, a Bouvier and two or there unidentifiable dogs. I also started chasing pigeons. I couldn't go over to say Hi to the dogs because I'm still on my medicine for Kennel Cough. Huge sigh. Mommy and Daddy are working on making my semi-quarantine exciting though, and I am getting LOTS of cuddles. It's never enough though. Oh! Just as I was sitting down to write, Daddy came home from work! He'd forgotten something. I think he missed me. But he's gone again now. Sigh. I miss you Daddy! Hurry home so I can kiss your nose again! Mommy said something about Grandad coming next week for some photography shoots with us. I'd better practice my pei-fessional modeling for him! She also said there were adventures happening between now and then. But she didn't want to elaborate. Counting on my paws, I think I have until Friday for my medicine to run out, so it won't be day camp time until those are finished. Guess I'll have to wait im-pei-tiently for more details. It's been a snuggle day here at our house. Since Mommy is the one with the camera, and she's been snuggling with me most of the day, there aren't any pictures. Daddy doesn't use Mommy's camera without asking or explicit instructions. And Mommy doesn't use Daddy's tools without permission and explicit instructions. Hey, it works for them. Let me tell you all about my snuggling adventures. First I had to snuggle with Daddy when he came back to bed at some ridiculous hour of the morning. When he got up, Mommy came back to bed so I had to snuggle with her. Then Daddy came home so I had to investigate. I had a nap to recover from all the snuggling, then went out for an adventure with Mommy. When they came back from the bookstore, I had to snuggle with Mommy while she read her book. At first I snuggled on the floor. Then I told Mommy to move over because she was in my corner of the sofa. She wouldn't move so I sulked a bit. That didn't move her either so I just jumped up on the sofa and used the other half. Now Mommy is finished her book and it's time I snuggled with Daddy. After I get some exercise playing with the toy Aunt Sharon and Uncle Marty sent. Dun da da dah! Welcome to another edition of Bolo's Friday Weather Report and Other Adventures. I'm your host, Bolo. As you can see, the day is looking blue and awesome! I suggest everyone find a sunbeam and meditate in it. I, being the dedicated pei-fessional photographer's model, had to work. Actually, I had to be coaxed to work. In fact, I don't think I've gotten my payment for working yet. Mommy? You owe me a cookie! I really should ask for payment up front. Pei sigh. Hang on Mom, let me get into position. Sigh. There's the money shot. It's all about the nose pei-bies! Regal and dignified. I need a crown. I think I look very royal. With just a bit of an Elvis twist to my lip. That could be the shadows though. Hail to the King pei-by! Well, I'm done working for the day, no, that's not true. I still need to patrol the backyard a few more times today and bark at the people who leave papers at the door that Mommy then takes and walks from the front door right to the recycling bin at the back door. She really should just have them drop it in the recycling bin to begin with. Maybe if I'm lucky, Uncle Brett will come over and I can show him how great a pei-fessional model I am. Pei-Ess, I know Maggie and Mitch are off on vacation, have fun guys! We'll miss you while you're gone! Oh yeah, and Mommy and I want Oorvi to know that she has a really nice curly tail. No! I'm not flirting with her! I just like her tail, the way everyone likes my nose. Sheesh! ETA: Would you look at this! I'm a double medalist! 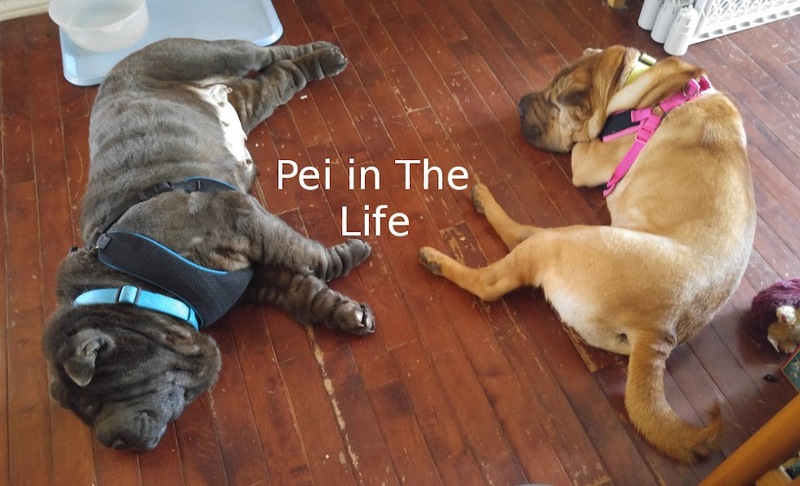 I'm in a Relax-pei-tion mood. There are sun beams in my house. It's my job to check them out. They come out a lot better if the back door is open for me so the door has been staying open quite a bit so that I can investigate all these sunbeams. Mommy caught me concentrating on one yesterday. You don't need to lie down and meditate on it, although that's comfy too. Sometimes you just need to stand in it and absorb it. And other times you need to stick your nose right in it! Pei Laughter! Here I am just checking out my backyard from the doorway. My backyard is very sunbean enabled. I'm such a lucky pei. Wednesday and I want a Wheelie! Maggie and Mitch have Autumn, Mango has Hector. I want a Wheelie. So I've asked my wonderful Uncle Brett to make me one. My birthday is coming up on September 12 so maybe it can be my birthday present. In other news, I thought I'd share with you what has now become a twice daily occurrence. Yeah, those are my antibiotics. Mommy and Daddy give them to me with Rollover. (Mommy says it's like pate for dogs.) Oh, and yes Mango, I chew all my food. Even the cookies. My Granny is always surprised that I chew my food. Her dogs have always needed speed bumps in their food bowls like Mango's housemate Dexter. Anyway, I'm still not feeling very photogenic. But I knew my adoring public needed a nose shot to keep them going. It's tough having a fan club for ones nose let me tell ya. Mommy posted this one just because. Which, I think anyway, is always a good reason to post a good picture of me. I think she should have put the bigger flash on for this one, but it's ok. In other news, Oorvi won a Bronze Medal in Working! WOOT! Go Oorvi! I think all my friends who entered have won a medal except Charlie Daniels. I think he should have won a couple, his entries were great in Mess Making and Track and Field. I'm keeping my paws crossed for you Charlie! Oh! One more thing. My Grandma asked Mommy to send her the linky for the Bone Relay, she's going to show us all off at work! With particular care to the second entry from Canada (Me!) but I hope she also points out all my friends too. Mommy says I'm full of P & V. (Piss and Vinegar). I get the feeling this is a good thing. I've been so blah lately with my cough that Mommy's happy to have me rushing around like a goof. Today was nice. I slept most of the day until Mommy came home. Then we had to rush off and rescue Daddy from work. We made a pit stop and Mommy took me into the other Pet Store for Rollover. She bought two rolls for me, and a treat! No toys this week, but I still have my nifty toy from Aunt Sharon and Uncle Marty. It's still in basically one piece. I got a chance to sniff oodles of things and pee on all sorts of stuff. It doesn't get much better than that. When we got home, Mommy handed my my treat. It was a peanut butter cookie! I took it very nicely from Mommy's hand and walked it over into the living room where I put it down on the floor to sniff it properly. I'm a well bread little puppy though so I had me supper first and then, when everyone went upstairs to the computers, I brought my cookie up as dessert! Now I'm basking in the presence of my pawrents; and cuddle pigging them as often as possible. Pei Laughter. So, here's my nose for everyone to smooch! Sniff ya later! I want to thank everyone for their well wishes. Sorry I didn't write yesterday but I was being a cuddle pig. I'd go cough cough and Mommy or Daddy would cuddle me. It felt good. I needed a cuddle day. Yes Grandad, I knew that the sign Daddy made had the radioactive symbol on it. It kept people away at least. It also said Bio-Hazard Warning. Infected Shar Pei (Typhoid Hairy) Kennel Cough. Daddy was being funny. Mommy and Daddy say the antibiotics are working. It's only been two days but I'm not coughing as much. I'm still tired and they said a little listless. More cuddles should help. Anyway, I didn't want you all to go into kissable nose withdrawl, so I asked Mommy to put this picture up. I'm not up to a lot of photography right now, or writing and since today is a historically special day in our house, I'm going to write about that. Today would have been my "brother's" Adoption Day. I never met him, he crossed the bridge before I came here. Here's his picture. His name was Shih Kwan, because someone told Mommy that Shih meant first and Kwan meant Dog in Chinese. He was her first dog ever. You can see he has a much bluer tongue than me. I don't know if we would have liked each other, Mommy once said he didn't quite like black dogs; and we're total opposites personality wise - Mom says he was a loner and I've already mentioned I'm a cuddle pig. Our tails even curve in different directions. I don't know if I would have liked him, but I think I have a lot to thank him for. Without him, I wouldn't be here with my family. I truely believe that. He taught them all sorts of stuff about Shar Peis, and that gave them the courage to raise another one after he crossed the bridge because of liver and kidney failure brought on by Shar Pei fevers. I'm going to think on that today while being a bigger cuddle pig than yesterday. Sniff ya later! WARNING WARNING! 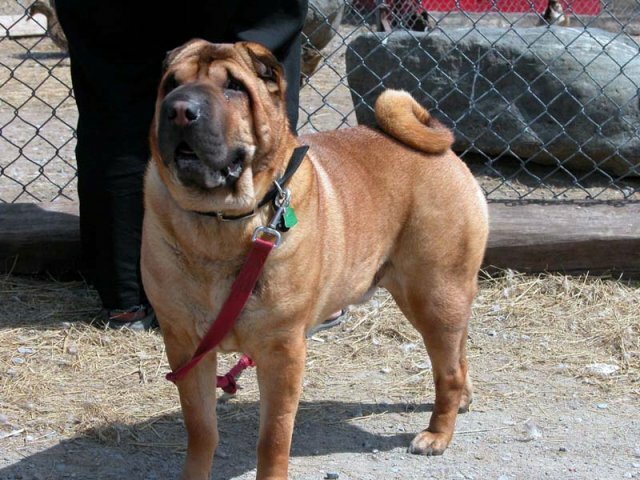 THE SHAR PEI WHOSE BLOG YOU'RE READING IS INFECTED WITH KENNEL COUGH. APPROACH AT YOUR OWN RISK! Yeah, that's me. Huge pei sigh. I've been coughing and gaging for the last two days and Mommy and Daddy were worried so we went to see Dr. Dunning at the Vet Hospital (and gave her my blog address. Hi Dr. Dunning!). The lovely vet tech heard me come in, I was coughing, and she said That sounds like Kennel Cough and I was put in semi-isolation. I wasn't listening too closely, I was kind of busy coughing, but I think they told Mommy it's a different kind of kennel cough from the one I got a vaccination for. It's apparently been cropping up in this area for the last few years. I almost didn't go to Daddy's friends birthday party today. But Mommy called them and told them I was sick and they said come anyway. There was only one other dog there and we stayed away from each other. But you'll see, Daddy made everyone aware that I was sick. It's ok. I slept a lot. I was tired, and it was nice to sleep knowing I was surrounded by lots of people; and I was outside the whole time! Only some of it in the sun though. Mommy made sure to keep me mostly in the shade. So I'm on antibiotics for the next 14 days. Hopefully that will clear it up. I've kind of stopped coughing, so that's good. I was sneezing a lot earlier. Now I'm just tired. I'm going to nap some more. Mommy got me up at WAY TOO EARLY in the morning. Really not sure why. Then she saw the sky and said, Weather report picture! So, here it is, Fanfare please! DUN DA DA DAH! Bolo's Friday Weather Report! It's going to be a great day. Not that you can tell by the picture but the sky is pretty clear. That's the sky facing west. Wait'll you see the sky facing East! You can see that at Mommy's blog. Thank you to Willow for being so protective of me. But I'm fine. Here's the picture of my scratch. Do you see it? It's there, kind of near my elbow. Yeah, exactly, no need to worry. Shar Pei skin is very thin and tears easily, but it didn't hurt to get scratched and I know it was an accident. You can also see how concerned I am about it. That's my mellow face. River honoured me with this lovely award. Thank you River! I'm supposed to give it to dedicated followers of my blog, but I think all my friends have theirs already. Charlie Daniels, River, Maggie and Mitch, Mango (Solidarity in Slobbers Mango! ), they all have theirs. Oh! Gaia doesn't have one. Has anyone heard from her recently? Mona? Do you have one? I'll give you one. Oorvi? Do you have one? I'll give you one too. Booker? I'll give you one too. And Willow. Hey, wow, that's 5. Hey! Wait! Lorenza doesn't seem to have one! There you go Lorenza. Oh, and I know my Grandpawrents (The Newmarket Gang) read my Adventures every day. They just don't blog. I think Miss Jennifer does too. Gee, I guess not all my friends had them. Daddy and Mommy are also regular readers. Oh shoot, I still have to do the dancing thing! Here's a picture from one of my first days here. That's my Daddy I danced up to say hello to. He doesn't have to bend down nearly so far now. Pei laughter! And his hair isn't nearly so short either! Almost more adventure then I can handle. Notice I said ALMOST. I had to rescue Daddy from work yesterday and then last night I went to my Great-Granny's for supper. That was fun. I got to see my cousin Tia and after supper, we all went to sit on the comfy chairs and I climbed up next to Great Granny, settled my chin on the armrest and snoozed while she scratched me. SHE forgot her camera. It was positively cute beyond words and SHE missed it. I blame HER. This morning I was off to Day Camp. AGAIN! As you can see, I had a good time. But all the excitement of the week was catching up to me and when I got scratched and started getting cranky - not aggressive, just tired - they said maybe I needed a nap. I agreed with them on that. It's not a big scratch and they cleaned it up for me. It's on my leg. It scared Mommy though because there was a note that the Snoopervisor had to talk to her so she thought I had done something or had something done to me. HA! Oh Mom of little faith! The Snoopervisor just wanted to tell her about the scratch and that I was super tired. Mommy said she likes the fact that the attendants are all very nice and open with her about my activities there and they don't mind talking about me. I had fun, but it's nice to be home. I need a nap to recoup some energy. Here's a picture from last year that pretty much sums up how I feel right about now. Do you guys remember that Mommy promised me another Adventure last night? Well, I got two. One of them was Uncle Brett, the pizza guy and the neighbours all coming to the door at the same time. I had just woken up from a nap so I was a little confused. But boy was it FUN! Then there was this: Yup, that says Veterinary Hospital. That's my regular vet. They know me and love me very much. Truth be told, I like them too. They're all very nice and they all say Hello to ME when I walk in the door, not Mommy and Daddy. They know who their client is. Mommy only wishes she could get that kind of service in electronic stores. So there I am going into the vet clinic. I'm always eager to go in and then I realize where I am and want to head out. But I think that's normal for all of us. Isn't it? Please tell me it is. Those legs belong to Daddy and the Vet Tech. I was just there for my Bordatella shot (I need one every 6 months to keep going to Day Camp) and there was one stitch left over from my incident that wasn't dissolving and was just hanging out. It wasn't bothering me but it was bothering Mommy. The Vet Tech - I'm sorry I didn't catch her name - took a good look at me (after a quick cuddle) and said yeah, she'd need the Doc to take that out. Here's the obligatory nose shot for the fans of my kissable squishable face. That's Daddy's arm in the picture. Here we are waiting for the Doctor. That's my Daddy in the background. You'll notice that you can't see my tail. That's because I wasn't a happy pei at that moment. Like every other pup, and probably a bunch of humans, I don't like going to the doctors! I like the doctors themselves, but you never know what they're going to do! Sometimes that's scary for a puppy. Finally Doctor Ives came in. I gave her a little tail wag when she came in. She cuddled me too. I think she likes me. She got that nasty stitch out, gave me my Bordatella shot - for which I am a super trooper because I didn't even flinch - and gave me a quick checkup. You know, I kind of look like I'm laughing there. Not at her, at Mommy for taking the picture! Pei laughter. Pei-Ess, I saw that River sent me an award, Thank you River! I'll talk about that tomorrow! Tuesday and the Adventures Never Stop! Well! Quite the exciting day for me. I woke up this morning, very early, to climb up onto the bed and curl up against Daddy's leg. He's very warm and I wasn't. Then I had to wake up again later, after Mommy and Daddy woke up , because I needed to pee. I heard interesting noises inside while I was outside doing my thing and I came in to see Mommy putting food in my travel bowl/lunch box. She only does that if I'm having an ADVENTURE. So I danced around and sang a little bit to let her know that I was excited. You guessed it! 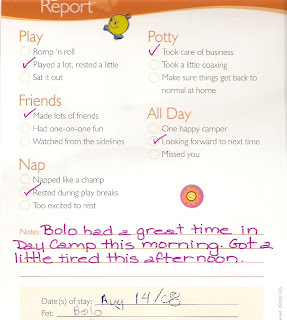 A day at Day Camp! WOHOO! Here's my Pawgress Report. I played really hard with a Golden Retriever, I'm blanking on his name. Then, I had a nap and some lunch. Or maybe it was some lunch and then a nap. I forget. It's been a busy day. Then in the afternoon I played hard. By the time Mommy and Daddy picked me up, I was tired. Unfortunately, Humphrey the BIG HUGE Clifford wanna be, wasn't. I didn't get mad, I didn't get even. I just tried to hide behind the attendant. Then I saw Daddy at the window! I had to jump up and say HI!HI!HI!HI!HI! and wag my tail and sing. Daddy was impressed, I could tell. When they opened the door I went whoosh! right out because I had noses to kiss! I was not aggressive at all, Mommy is really proud of me, Daddy is really proud of me and the attendants at PetSmart are really proud of me too. That's a warm fuzzy. Mommy says the adventures aren't over. I wonder what else she has planned? I'd better nap to recoup some strength. Pei-Ess, Sorry no Me pictures, Mommy guarantees some for tomorrow. As you all know by now, I'm sure, The 2008 Pawlimpic Games are off to a GREAT start with everyones favourite Shar Pei, ME, winning the highly contested Sleeping Event . I'm still in shock and awe. My pawrents are so proud, our friends and family are thrilled too. Me? Mommy says I'm handling it like a trooper. I'm not letting the fame go to my head. There are still two weeks left in the games and I need to be focused to win my other events. So, since this worked the first time regarding my entry into the sleeping event, I'm posting my entry into the Singing Event to see if I can medal again. Mommy likes this picture because it shows off what she calls my Little Old Man Lips. Humph. Not my fault my bottom lip looks like a little old man's without his dentures. I know she loves me though or she wouldn't have saved me from falling off the bed this morning. In other news, River, my Beagle Pal, has tagged me for a dancing thing. Mommy doesn't have a video camera River, but I think we can do something for this with Daddy's help and continuous shooting with the regular camera. We'll work on that. I'd like to thank all my blogging doggy friends for their continued support through these Pawlimpic Games. Just to let you know, I'm cheering all of you on too. A Gold Medal! I won a Gold Medal! In the sleeping event! Oh my dog! I don't know how I should react to this. I've added the win to my sidebar. I'm so excited, I think I need a nap. Here's the picture finally of my Uncle Brett and I! I don't know why his cheeks are puffed out, I only weigh 60 pounds. It's not THAT much. In answer to Willow's questions, by the way, welcome back Willow, he's not my PERSONAL Brett. He's just my Uncle. He has a house almost next door and he comes over a lot to scratch me. Mommy says Brett is a cat person, except when it comes to me. Excuse me, I have to wake Daddy up so he can get Mommy to work on time. Mommy and I were just cuddle wrestling in a sunbeam in the living room this morning and I out manouvered her with my patented spontaneous nose kiss attack. Pei laughter! We also had a four hour cuddle fest yesterday during the Opening Ceremony of the Olympic Games. Not enough cuddles yesterday though, even after a four hour cuddle fest. I have a cuddle deficeit! In REALLY GREAT NEWS, my Uncle Brett is back from wherever he was! He's been gone a WHOLE YEAR! I'm not really sure how he survived a whole year without ME, but he's back now. Mommy says as soon as he's awake and comes over she'll take pictures of us. I hope that he gets his phone soon because he calls us first and Mommy says Brett's coming over and I run to the door to meet him! I think he likes that because he's always willing to give me ear scratches. Since the camera hasn't come out , I don't have any fresh pictures. I have to talk to Mommy about that. But, I don't think I've shown this one yet. It's me, looking over my fence in the backyard. Oh, and a reminder to everyone about the Paw-Limpic Games. Check out Lenny's Blog for all the results. My First Event is sleeping, which I think happens tomorrow. I'm all excited about it. Dun da da dah! Welcome to Bolo's Friday Weather Report! Grey and yucky. Rumour has it that it will be grey and yucky all weekend too. This kind of works well because Mommy and I will be cuddled up together watching the Opening Ceremonies of the Olympic Games this morning! Grey days make me cuddle prone. Ok, every day makes me cuddle prone. Oh, and head to Oorvi's Playground. Remember that secret she's been holding back from me for a few days? It's another Pei Clock! I'll have Mommy add it ASAP to my sidebar. Make sure to roll your mouse over it. It's spiffy cool neat-o! Thank you Oorvi and Mercury and Cameo! 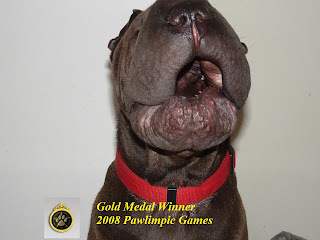 In the spirit of the games, here is the picture I submitted for the Drooling Event of the Pawlimpics. Check out Lenny's site for the schedule of activities. Oh boy I'm all excited! I'd better nap to conserve my strength. 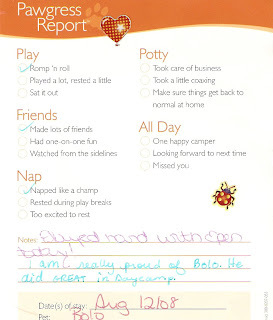 The Good: I went to Day Camp today! I had fun. The Bad: But they had to remove me from the room at one point because I was getting a bit too agressive. Mommy told them to make sure I didn't get TOO aggressive. It was my first time back since the INCIDENT. Mommy and Daddy want me to go back to be socialized because they don't want me to be overly aggressive. -I- don't want to be overly aggressive, but sometimes......sigh......instinct takes over you know? I'm trying. I really am. There was also some talk of an overnight stay. Overnight? Without Mommy and Daddy? Who will I cuddle up with? I'll have to think about that. The Clean: Me. Yeah, bath time. Blech. I did my best to avoid it. I even tried to hide in the linen closet but there were too many towels and I couldn't get onto the shelf. Although, this isn't too bad a picture of me. And because everyone commented on my pink towel last time, Daddy made sure I got a macho towel this time. Is that macho enough? Pei-Ess. Oorvi has been taunting me about something that will appear on her blog. But it's not there yet! WAH! I'm waiting im-pei-tiently. Some good news and some bad news. Bad news first. Daddy told us today that my cousin Gabe, a 12 or 13 year old Yellow Labrador, crossed the Bridge on Friday. By that point the paralysis had spread from his back legs to his front legs. The vet went to Gabe's house apparently and Gabe crossed soon after. I'll miss you Gabe. Run free. In good news, I'm really proud of my Mom. Mommy said that a lady this morning went into the center where Mommy works and asked her to call the Humane Society. In the woman's hands was a probably less than day old little black puppy. Eyes still closed. Mommy called the Humane Society but they weren't open yet. It's not that far so the lady walked the puppy down the street and around two corners. Mommy gave her a towel to wrap it in though. Good luck to you little puppy! In other good news, or, like my Daddy said, Blog-fodder, I got a package! From Aunt Sharon and Uncle Marty! It's a stuffie! It says on it Squeek Less Drool More. Like I need incentive to drool. Pei laughter! I had to fight Mommy for it though look at that! It's like she wanted it for herself! I finally got my teeth on it and the first thing I did was rip a hole in it to see what was inside. Stuffing. Nifty! Thank you Aunt Sharon and Uncle Marty! Specialty Nose Kisses for you! Now the whole reason behind the package! Aunt Sharon saw this store, Bark & Fitz , in the town where she works and thought of me! Now THAT'S LOVE. I'll have to encourage Mommy to take me there. They apparently have a bakery. I'll have to sniff that out. That's my news. Sniff ya later gang. Pei-Ess, I'm glad the last time I saw Gabe I made sure he knew I loved him. I need everyone to hit Lenny's Site to see this. It's the International Bone Relay! Lenny and his Family did a PAWESOME job! The Canadian team starts at 3:04 and I'm at 3:08. Pei Laughter. But watch it all at least once because it's worth watching. And I saw a lot of my friends too! Maggie and Mitch I was able to pick you out! Oorvi, you looked great! And Charlie Daniels, you looked just devilish! 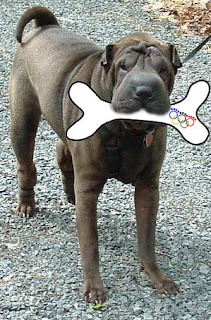 For those who needed a closeup of my Bone Relay Picture, here it is! Thank you so much Lenny and Family! I feel all pumped for the Games now! Pei-Ess, I forgot to say I saw Lorenza too, representing Mexico! Well done Lorenza! Well, it's Monday morning and Mommy's friends have left. I tell ya, I was jumping though. It was my job to wake them all up in the morning. Miss Melissa I'd wake up by needing to go to the bathroom and having to pass next to the sofa bed in the living room. Mommy wouldn't let me jump on the bed and kiss her. This is as close as I got. She just wasn't in a kissy mood I guess. It's too bad, Mommy says I'm a great kisser. Then Mr. Christian, who was sleeping in the basement, I'd have to run down the stairs and bark at. This morning though, because I knew he was leaving I jumped on the bed and barked in his ear. He appreciated it. I could tell. I wasn't too keen on giving him nose kisses. I'm still not sure about it as you can see. Then this morning, I had to make a muffin run. Down the street, next to the PetSmart there is a Tim Horton's Donuts. Mommy, Melissa and I went to pick up muffins for breakfast! It was a big responsibility, but I handled it well. Thank you to everyone who said they missed my smoochable nose. This might encourage Mommy to post more pictures of it. I think that's it for me today. I have to recover from my visitors. Now TOMORROW will be fun because I think I'll be allowed to post the picture Lenny's Mom did for the Pawlimpics Bone Relay! Mommy and Daddy LOVED IT! It's really strange having people visiting. I had to bark when they came to the door of course, because that's my job. Then I had to sniff and sniff and sniff and bark some more. They had to know that this is MY house. Mommy's friend Melissa is nice, she smells like cat so I made sure to cuddle up to her. Apparently her cats won't be so happy when she gets home. Mommy's other friend I wasn't too sure about. He's a boy human. What? Man-human. Mommy says 33 year old don't like to be called boys. Whatever. We had to have an alpha conversation and I'm not sure that I won. Hmmm. I'll have to think about that one. Well, since Mommy is busy with her friends this weekend, although I am getting BARELY enough cuddles from everyone pei laughter the camera hasn't come out so there are no pictures. Sorry guys. I'll have words with Mommy about that. Mommy did make sure to include me when they went out to the ice cream place last night. Even though I didn't actually GET an ice cream, it was nice to go in the car. Oh, they're all awake! Sniff ya later! I have to mooch cuddles! Dun da da da! Welcome to Bolo's Friday Weather Report! I'm afraid to say it doesn't look too good weather wise everypuppy. Grey and overcast and you can just feel the rain building up. Guess we'll all need to stay home and be cuddled by our pawrents! Aww. Pei laughter. So this is how the day started for me. Yeah, anyone else see something wrong with this picture? I had to give Mommy THE LOOK. And she finally refilled my food and water dishes. I thought I had asked for prime rib though and all I got was lamb and rice. I'll have to talk to the management. Pei laughter. In other news, there is construction going on just over my fence. They ripped up the asphalt yesterday and today they went along and pressed it all down with a machine. I, of course, had to snoopervise, because that's what a pei does. I do that very well from my back step. Until Mommy distracts me! Sigh. What am I going to do with her? So, this weekend Mommy has a friend coming over! I met him at Christmas last year and he was kind of fun. I have to go and prepare for that. Find my Yellow Buddy in case Mommy's friend wants to play throw with me. Maybe my spare bone, that we Mommy can stuff both with treats and we can share them. It always taste better with another doggy's spit on it. Anyone else notice that? I will leave you with one more picture of my classic pei-profile. Sniff ya later!